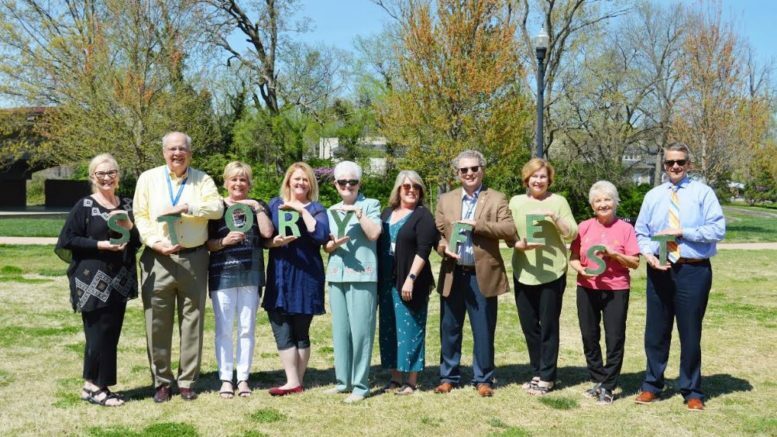 Preparing for Storyfest in the Park on May 4 at Dogwood Park are, from left, Cindy Putman, 2018 Amateur Storyfest Competition winner; Rick Woods, Cookeville Leisure Services director and event emcee; Laura Wolf, City Scape executive director; Ashley McKee, Cookeville museums education specialist; Judy Duke, Storyfest founder; Beth Thompson, Cookeville museums manager and Storyfest coordinator; Chad McDonald, Cookeville Leisure Services cultural arts superintendent and Cookeville Arts Council member; Barbara Walton, Friends of the Cookeville History Museum; Peggy Fragopoulos, Storyfest ambassador; and Ricky Shelton, Cookeville mayor. DATE & TIME: May 4, 9:30 a.m.-5:30 p.m. The adult workshops are $25 each or $40 for both. To register, go to www.cpactn.com. The children’s workshops are free, but participants must pre-register by calling the Cookeville History Museum at 931-520-5455. Space is limited. Be the first to comment on "Storyfest Returning To Dogwood Park May 4"